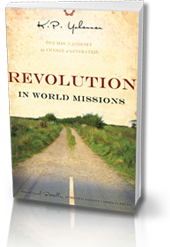 Get Revolution in World Missions - Free! With fascinating true stories and eye-opening statistics, you'll be challenged to examine and change your lifestyle in view of millions who have never heard the Gospel. If you enjoyed the book and would like an additional copy to share, the book includes a card that can be completed and returned to us. The card asks you to provide the contact details of the person you shared the book with, and also serves as an order for a replacement book that we will forward to you.